You'll be £19.99 closer to your next £10.00 credit when you purchase Knights of the Battle of Britain. What's this? The Ritterkreuz des Eisernen Kreuzes (Knight’s Cross of the Iron Cross), known simply as the Ritterkreuz (Knight’s Cross), was the highest German military award of the Second World War. Instituted on 1 September 1939, to coincide with the German invasion of Poland, it was awarded for leadership, valour or skill. As the war progressed, higher variants were instituted, namely the Knight’s Cross with Oak Leaves, Knight’s Cross with Oak Leaves and Swords, and the Knight’s Cross with Oak Leaves Swords and Diamonds. Chronological and alphabetical indices complete a useful reference. With useful cross-referencing appendices and a proper index, this 6½in x 9½in hardback is an attractive reference work of real value for those seeking a more nuanced perspective of the battle. An unusual and fascinating addition to the history of World War II. I have most of this author's books and this one doesn't disappoint. Comprehensive biographical details on Knights Cross holders are illustrated with contemporary photos, many of which I have never seen before in any publication. A worthy addition to the library of anyone interested in the Battle of Britain. 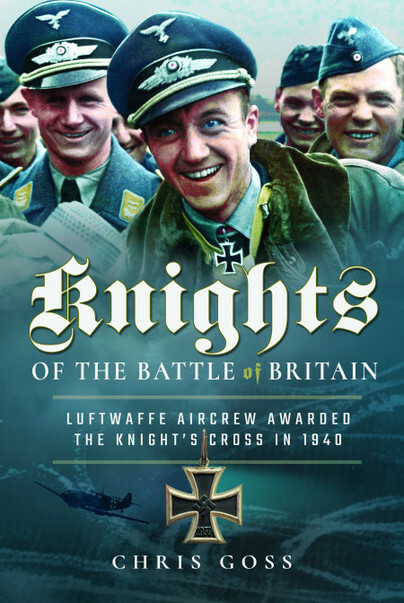 Luftwaffe expert and regular FlyPast contributor Chris Goss is the historian responsible for this excellent series of profiles.